Global nomads have a new tropical island retreat. Pullman Phuket Panwa Beach Resort welcomes travelers to an absolute beachfront location on Makham Bay. The luxury hotel blends contemporary design with subtle Thai accents, making it a perfect holiday resort. Pullman Phuket Panwa Beach Resort is 45 minutes’ drive from Phuket International Airport (HKT), a nexus of international airline routes. The regular shuttle bus to vibrant Phuket Town and Central Festival Phuket Shopping Mall keeps you connected. Travelers have a choice of 211 spacious contemporary rooms, including 28 suites and 29 villas with a private pool. 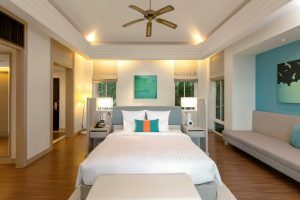 Many rooms come with sweeping views of the Andaman Sea, and all come with a balcony or terrace and free high-speed Wi-Fi connectivity. Tamarind restaurant offers authentic Thai cuisine, presented with contemporary flair against the striking backdrop of Makham Bay. 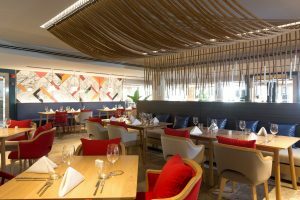 Guests can start their day at the international breakfast buffet at Aqua restaurant, or enjoy favourite European dishes in this contemporary, family friendly restaurant. The Edge Beach Club and The Junction bars are ideal for a spontaneous poolside encounter or wind-down cocktails. Globetrotters stay connected with ultra-fast Wi-Fi in the spacious lobby and throughout the hotel. Versatile Meeting spaces, the best technology and dedicated Event Managers let teams concentrate on work. Elegant function rooms and the beachfront location make Pullman Phuket Panwa Beach Resort a dream venue for unforgettable Weddings. Pullman’s private beach and three freeform pools are ideal for water sports or lazing in the shade of the palms. Talay Spa offers a choice of inspired therapies designed to relax, rejuvenate and re-energise. Pullman understands the balance between work and leisure, performance and pleasure – because our world is your playground.